Since debuting on Jan Garbarek’s Afric Pepperbird in 1970, bassist Arild Andersen has been a staple of the ECM diet. Forty years in the making, Celebration pays tribute to the label that has been his home for just as long with a live “best of” recorded 2010 at Glasgow’s Royal Conservatoire. 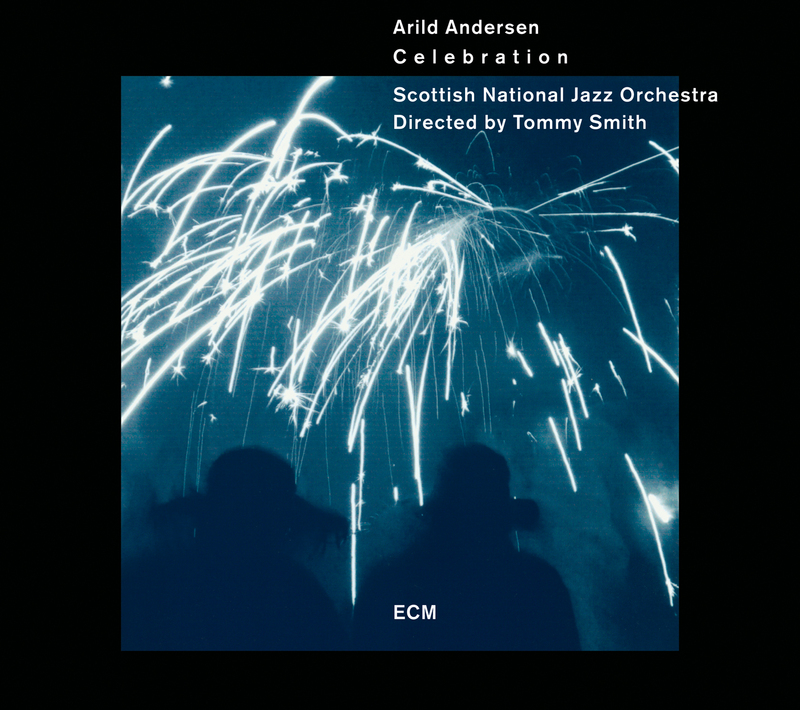 Flanked by the Scottish National Jazz Orchestra under the direction of tenorist Tommy Smith, Andersen is as much the focal point in this set of six tunes as the music itself. His role as primary soloist materialized at the behest of Smith, the two of them already well acquainted in their trio work with Paolo Vinaccia, and it was Smith’s compositional prowess that led him to propose and shape the once-in-a-lifetime performance documented here. “May Dance,” by fellow bassist Dave Holland, comes to us by way of the 1975 classic Gateway in a thoroughly swinging take replete with sulfuric interaction. Smith grabs us from breath one and throws us into a pit of melodious fire. Andersen and drummer Alyn Cosker—a team that becomes more vital as the set goes on—throw nets of excitement into the air and catch an entomologist’s worth of specimens. Compared to his essential Green In Blue, Andersen sounds as electrifying as ever in this concerted leadoff to an album of vivacious character. Part 1 of saxophonist Jan Garbarek’s “Molde Canticle” (I Took Up The Runes, 1990) is another fitting choice—all the more appropriate for also being a celebratory commission, this in recognition of the Molde Jazz Festival’s 30th year. Andersen floats here in a harmonic abyss, switching axes in slow tension with the horns. Smith’s muscled tone is an ideal match for Garbarek material, and his leadership of the larger forces at hand elicits some visceral making of music. “Crystal Silence,” off the eponymous 1973 classic by Chick Corea, is surely the album’s best known, though here it feels like the first time. The arrangement is decidedly aquatic. It places its feet on the shore, feeling wet sand between the toes, the scuttle of horseshoe crabs beneath, and the lapping of waves on the ankles. Before long, the world is submerged, blue in blue. Andersen’s robust brushstrokes evoke schools of fish, swimming as one. From the most to least familiar, the program changes gears with “Ulrikas Dans” by saxophonist Trygve Seim, whose big band sensibilities come through rather gloriously in this selection from his 2000 album Different Rivers. Andersen and Cosker are again the main attraction. They build Seim’s forested themes in dense pockets, evocative and sure, dropping strings and cymbals in the form of dreams. These elements render Smith’s cathartic revelation in the final stretch that much more satisfying. Andersen cannot help but include his own work, and here he selects Part 4 of his “Independency” suite from Live At Belleville with the aforementioned trio. Having first appeared on disc only in 2008, it is the most recent of the music represented here. It opens with Andersen’s bass, drawn at the touch of a bow, in an electronically enhanced echoing universe. Brass resounds like foghorns, voices in the night treading water in want of moon. This eases into some intuitive free dialoguing between Andersen and Smith, who dominate the stage with their forthrightness. Their combination of fawning glissandi and whisky expulsions spins a fuse, which Andersen and Cosker light midway through. Smith’s tenorism is the implosion. The group encores with Keith Jarrett’s “My Song” (from the eponymous 1978 album). Andersen clearly finds poignancy in its tender summation of a life lived for art. He consciously approaches his bass as the piece’s composer approaches the keyboard, his fingers melding with the instrument. To underscore this point, pianist Steve Hamilton joins him for a spell: the draw of a slingshot that ultimately sends us reeling into the distance. Andersen is duly enlivened by the atmosphere of his fellow musicians and of the timeless music in his hands. His voice leaps from the stage in sheer joy of creation, with every note proving his rightful seat in the pantheon of modern bassists. This is a fine recording as well, for it keeps the big band close enough to punch but far enough away so as not to overwhelm. The amplification of Andersen’s instrument has never sounded better. Credit must also be given to the fine arrangements, courtesy of Christian Jacob (Holland), Tommy Smith (Garbarek), Makoto Ozone (Corea), Øyvind Brække/Trygve Seim (Seim), Mike Gibbs (Andersen), and Geoffrey Keezer (Jarrett). A celebration indeed of a consummate artist, but also more than that: a masterful affirmation of all that is good and true in jazz. Thought I’d commented on this! As I think I said water, forests and Molde Canticle make it one for me. Great selection of tracks on this. It was a delight to hear Andersen’s take on classic Garbarek. A fortuitous meeting of minds!